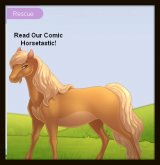 Here is my directory of the best virtual horse games! Try them out, then come back and share your reviews and tips for playing them! This is a Facebook game so if you don't have an account yet, get your parent's OK. You get a horse, take care of it, race it, and buy things for it (but it's free). This is a new horse sim game one of our hcgfriends's told me about. Try it and let me know what you think of it! This is a virtual horse game that lets you get horses, breed and train them. You can play it free for 20 days but then you have to pay to continue. Let us know what you think! This virtual horse game was created by another horse crazy girl! It's a free game and it let's you breed, show and train horses. Click here to find more Horse Jumping Games!